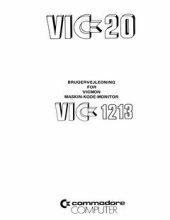 Again thanks to Uffe Jakobsen the Danish Vic20 manual for Vic1213 VICMON machinecode monitor is added. This introduces the VIC20 hardware section. This entry was posted in VIC20 Hardware by Carsten Jensen. Bookmark the permalink.